Most films this year have been average and rather disappointing. To me, there were only a handful of films that really stood out: The Young and Prodigious T.S. Spivet, Begin Again and The Maze Runner, the dramatic adaptation of bestselling author James Dashner YA novel. The latest really thrilled me and got my attention in every second. I was craving for information in every minute of the film and needed to know answers to what was going on. The 2h running time went by so fast and though the story was somehow closed in itself, it left room for some interpretation and you could tell that there will be a second film following. Of course, I'm an impatient Germ, so when I got back home after seeing the film, I ordered the first book straight away. It took me a while to finish it, as the narrative and writing style is a bit different to the film and there are some deviations to the adaptation. Can you really compare a book to its adaptation? Yes you can, though I appreciate both mediums as individual art forms and know that it is possible to bring a literary template to life successfully. Coraline or Perfume are excellent role models to prove, that it is possible to create a visual execution that complements a great piece of literature. The same applies to The Maze Runner. I found Alby in the film much more charming than in the book. Film Alby is the leader of the camp and is very friendly towards Thomas. He shows him around and has a strong presence to keep people calm and be in full control of the situation. I found the book character much more aggressive and hostile as he went through the changing. Book Alby is scared of the outer world because he’s seen the flare and catastrophe which awaits the Gladers once they’ve solved the Maze. It is his fear to go back to an apocalyptic world that hinders him to support Newt and Thomas in their search for an exit. Pretty much all the characteristics of book Alby have been taken over into film Gally. 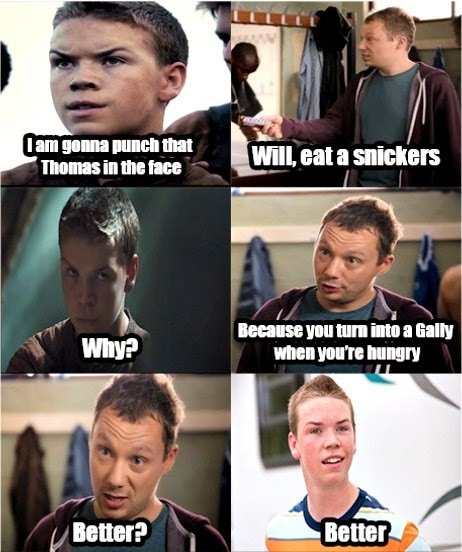 Gally, embodied by Will Pouter, is also more cocky and arrogant towards Thomas. He turns mad towards the end, which is similar to the book version. Gally in the book is pretty much mad right from the beginning as he has been stung and went through the changing such as Alby. The ending in both, film and book, made me wonder if Gally was a spy for WICKED. It is also not clear, what’s happening to the book character at the ending which was made very clear in the film. Then there’s Thomas, whom I like more in the film. He’s more confident, eager and passionate than the book Thomas, who cries and whines most of the time. Film Thomas is a character who acts fearlessly and is ambitious. He realises very quickly he doesn’t belong to the Glade and he needs to find a way out of it. All characteristics which I missed in the book character. Thomas is mostly scared and whimsy. He has little impulse to take actions nor to leave the Glade. Instead, he makes a lot of wasted effort to blend into the hierarchy and wants to impress Newt and Alby. I found him extremely annoying and passive in the first half of the book. He’s not a leader in my opinion and Newt had to talk some confidence into him, which the film Thomas already had and Newt supported him in his ambitions to solve the Maze. Certain events in the film are told differently than in the book. The team spirit is much more comprehensive and feasible in the film. People work together and Thomas is accepted as a part of the Gladers quickly. The film pushes the plot constantly forward, so there’s never a boring minute and the Gladers are consistently confronted with the Maze and their desperate wish to solve it. A major point which gets lost in the book numerous times. In the book, the Gladers are mostly pissed, aggressive, tired of involving people and to act as a team. The book focuses a lot on the Glader’s language and hierarchy. This becomes tiresome and boring as there’s little action in comparison to the film. It took the Gladers ages to find a solution for the Maze, some sequences been wasted on elaborate talks about nothing, the complicated slang and the cooking skills of a character. I do understand that book adaptations will always differ in some ways and work differently, as books and films are two independent art forms. However, in terms of action and plot, I found the film version rounder than the book, which loses it's tempo and slows down every so often. The solution to the Maze is told differently in the book and in the film, and I found both versions work well for the respective medium. In the book, Minho and his team created daily maps of the sections in the Maze. Once they've been compared to each other, they revealed a word pattern which turned out to be the code for the Maze’s exit in the Griever's hole. In the film, an easier version to tell the complicated code system has been used. Thomas kills a Griever which contains a key. This makes sense as it explains how the Griever got in and out of the Maze in the first place. Also, the interchanging sections that revealed the cypher code to leave the Maze work for the film. To sum up, I think the film is a great adaption of the book. Events are told slightly differently but they are better connected. The book has the major advantage to explain more complex ideas, e.g. the coding, Teresa's character and the changing, which make it more in depth than the film. I really like the series and I’m hungry to know more what’s going to happen to Thomas, Teresa and Newt in upcoming parts of the series. My Maze Runner Scorch Trials review is up on Style Lingua, too. Did you see or read The Maze Runner? 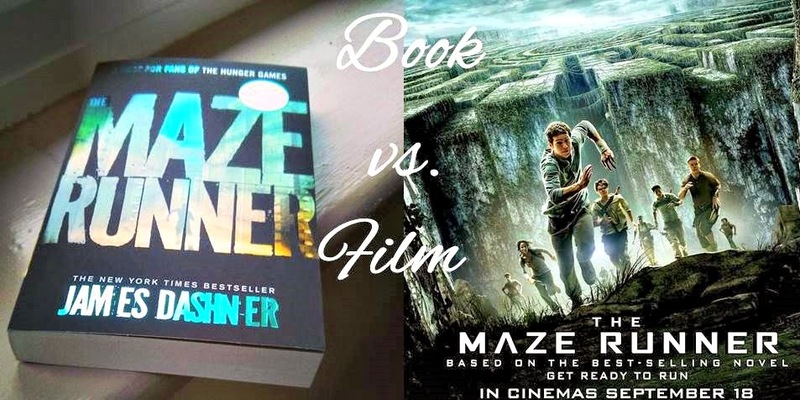 Which one did you like more, book or film? Thank you so much for reading today's post and I hope you'll be joining me on my next adventure.